Carbohydrates have a big impact on weight because they are broken down into glucose, which in turn raises your blood sugar. They are found in starches such as cereal, bread, and pasta, and in sweets such as cakes and cookies, but also in many “good for you” foods like fruit, starchy vegetables like potatoes, peas, and corn, and dairy products including milk and yogurt. 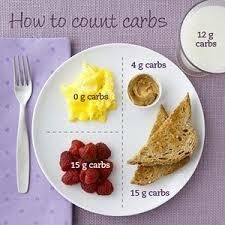 Learning how to accurately identify and count carbohydrates will help you lose and maintain your weight. On my eating plan, having between 50 and 100g of carbs a day helps me to lose and maintain my weight. You can buy a carb-counting book, use an online version, or download a smartphone app to see how many carbohydrates are in the foods you eat. You can also read the nutrition label on prepared foods to tally up the number of carb grams in each serving. You might have to guesstimating carbohydrates at a restaurant. Use measuring tools. At home, use a food scale to weigh that apple or whole-wheat roll. Use a measuring cup to dole out your portion of cereal or pasta. When you measure the serving size, your counts are more accurate – and you learn what a ½ cup or 1 cup serving looks like. Keep the tools handy so you’re not searching for them at every meal. I don’t even need to bring cups with me anymore. Use every day visuals. For example, a cup of fruit, starchy vegetables, or ice cream is about the size of a baseball or an average fist. A pancake or waffle is equal to a CD. Then you can look up your serving size using a carb-counting guide or smartphone app. 16 tablespoons is 1 cup. So 8 tablespoons of macaroni salad equals 1/2 cup and 30 grams of carbohydrates. Do your homework. Before you head out to a restaurant, check out its menu online. Decide what you’re going to order, and then gather the nutrition facts for the ingredients to put together a guesstimate of the carbs in your meal. Many restaurant chains now put all their nutrition facts, including carbs, on their Web sites. Mind the proportions. Know that the more grains and starches in a dish, the higher your carb estimate. For instance, you can count an 8-ounce cup of a broth-based soup as 15 grams of carbohydrate, while a thick soup with beans, lentils, or noodles should be counted as 30 grams. There’s an app for that. There are many apps available. Many are free, and many can help you with counting carbs. For example, GoMeals provides three apps in one – a database of nutritional values (including carbs) of thousands of foods you’ll find at the grocery store and your favorite restaurants, a tool to track and record your meals, and a restaurant finder with menus and nutritional information.